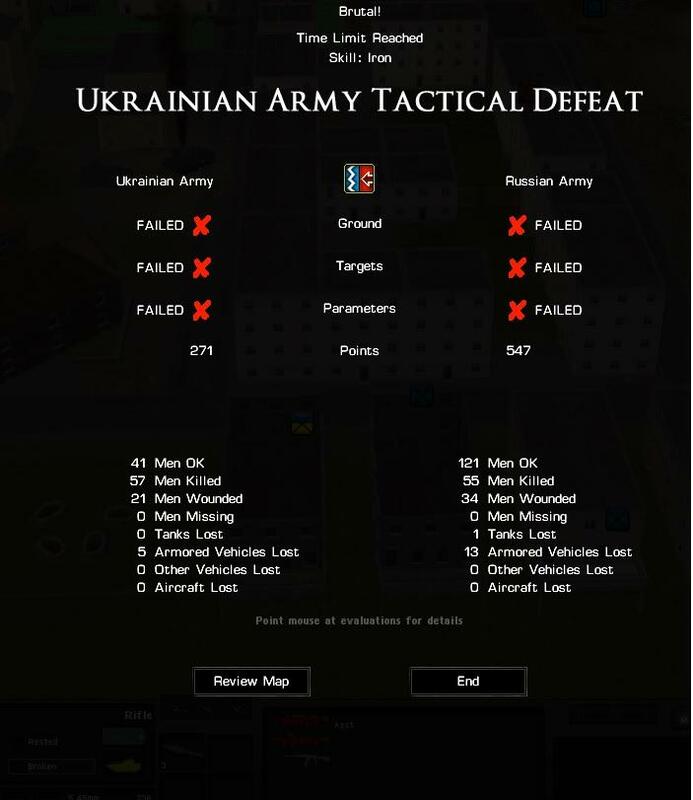 This scenario I have played three times as the Ukrainians, doing three different defense plans. Two of scenarios ended in brutal street fighting and close quarter battles. One plan was the fall back to the victory zones in the city, repeatedly ambushing the Russian forces in street to street fighting. That one turned out fairly well in the end with solid victory but the casualties were high (but acceptable in regards to victory conditions) for the Ukrainians. Next, I tried a 'Hold the Line' type of defence. It went well until the second wave showed up and then I got slammed as the mass firepower of the second way decimate the defenders and the Russians pulled off a win. This is an outstanding scenario for learning and perfecting defensive tactics and force placement. The map is generous enough in size to allow pretty much any defensive plan to be attempted. The terrain will be a curse to you for long fields of fire, making this for the most part, a close to medium range fight, Try as I might with different layouts, it is nearly impossible for long range ATGMs shots due to the wooded windbreak lines of trees and the rolling nature of the ground. The older ATGMs of the Ukrainians are adequate when vehicles are in the open but very nearly miss every time when shot through even a thin row of trees, making most ATGM shot 500 metres of less the norm for this scenario. That said, with small anti-armor teams (RPG-7s) using the terrain to max advantage, one can make the terrain a nightmare for the Russians to push through. I will avoid spoilers but will offer up one very significant piece of advice - Target arcs are your very best friend for this scenario to control your fire and set the engagement ranges when it benefits you. The Russians are not a overwhelming force but the sheer firepower they have will result in them tearing your forces to pieces at range if your forces engage haphazardly. Finally, a big shout out to Pete Wenman (the designer) for this wonderful scenario. It is everything a great defensive scenario has to rivet someone like me to play again and again. It is such a nail biter that 55 minutes seems like an eternity when the Russians bring their firepower to bear on you. But it is possible to win and win big if your defensive chops are up to the job. Thanks for posting this, I played it twice already with poor results. I will try the ambush them in the fields ploy as I tried the 2 methods you mentioned with poor results. I hope you are enjoying Brutal, and the name should have given some indication of what was to follow. Playing as Blue is always going to be a challenge with this scenario, so I suspect you are getting on better than you think, despite the final score. Retain the victory locations where you can. Use your best Atgm against the toughest targets and shot and scoot as much as you can. Otherwise play as Red and enjoy the pain you inflict. I don't think I've ever done better than a draw playing as the Ukrainians.....Must give it another go, try something a bit different. Ive found a combo of street fighting with an exterior flanking force (usually through the little village at left, then across the river and up over the slope in front) is good. But that force must NOT break out too soon. Also, Peter has some nasty AI plans in there, so keeping that flanking force as a mobile, last ditch reserve is very useful. I once had to return the entire force (1.5 pltns plus 2 atgm teams) to deal with a very bad MBT charge up the main street. Brilliant scenario, one I very consciously emulate and keep in mind when designing. Brilliant scenario﻿﻿﻿﻿﻿, one I very consciously emulate and keep in mind when designing. That's very kind of you @kinophile . It is always a challenge to get the AI to attack in a credible manner but l think it works ok here. It does mean the Redforce is a little stronger than in a truly balanced scenario (whatever one of them is ), but l guess that makes victory over Red all the sweeter. I love scenarios like this-straight and to the point. I lost, but had fun losing and going to give it another go around. Some of the things I did. 1. Load up with lots of ammo and AT weapons. I equipped HQ units with AT weapons. I don't know how realistic this is. I've always understood that Company and higher HQs should not be using heavy crew served weapons or portable AT weapons, but in CM if you have them available you may as well hand them out. I always try to make sure my platoon HQs have AT weapons if possible and give them more ammo. 2. Smoke is your friend. It blocks LOS and prevents the Russians from standing off and using their vehicles from pounding you at a distance. I'm sill learning how to best use smoke. In numerous h2h games and games vs AI I get the sense that smoke is underutilized. Some of the very good h2h players I've encountered seem to know when and how to utilize smoke screens to their advantage. This is something that has bugged me ever since CM2 came out in 2007. What is a realistic load for troops (and HQ's) and what is the realistic role for XO's, 2IC's etc? It is so tempting to load up troops incl HQ's to the max and use every unit including HQ's in a combat role. My SOP now is to limit small arms ammo loads to around 400 rounds per man, maybe more for a MG. Also keep HQ units back in safety as much as possible without extra ammo and maybe give them one AT weapon max for emergencies. Also... even when a couple of guys are carrying several thousand rounds plus AT weapons they don't seem to tire as quickly as one would expect. Seems like the amount that a small team can carry is too generous, or the unit should be movement and fatigue penalized much more heavily than at present. Hope some more experienced combat veteran can comment on what are reasonable combat loads per man or per team. Easy enough to look up and find with a web search. Per the above we gamers are allowed to overload our troops to an unrealistic degree. BF is correct with the 210 rounds basic load. My standard SOP re extra ammo during set-up is about 400 rounds per man total which according to the above blog seems about right for a heavy load. Maybe another 100-200 x 7.62 per man if they have an MG gunner. But, in the game it's possible to load close to (or over) 1,000 rounds per man plus ATR's in the team etc. and see little movement or fatigue penalty. That's unrealistic and maybe gamey imo. "...commanders will rotate individual sections/squads in an engagement to give them the opportunity to rearm and generally sort themselves out and will plan and organise an assault or defense such that logistics are properly taken care of." I don't know how realistic this is. I've always understood that Company and higher HQs should not be using heavy crew served weapons or portable AT weapons, but in CM if you have them available you may as well hand them out. I always try to make sure my platoon HQs have AT weapons if possible and give them more ammo. Obviously this is not the norm, but if the situation calls for it then it's plenty realistic to have HQ units with AT assets. After all, rank doesn't protect against tank shells. Might as well be able to shoot back. As to the question of a proper load of ammo, CM actually slightly undermodels the standard combat load for the US Army. I don't have the numbers from in game in front of me at the moment, but I recall if you break everything down, the riflemen have a combat load of 7 magazines (which is correct) but the SAW gunners only have half of their typical combat load. I think in game the standard for a US squad is something like 1800 rounds, which is a good 400 rounds or so below the standard in reality. Its also important to note that in reality, the situation always dictates how much ammo ends up being carried. A short dismount from Bradley's to clear a building would only involve the bare minimum. Whereas a light infantry patrol over the course of several days would mean that everyone would carry a lot of extra ammo. For example, while a standard combat load may be 7 magazines, most riflemen tend to carry double that when outside the wire. On top of this, certain weapon systems require buddy loading. A good historical example of this is German infantry squads and MG-42s, where the riflemen in a squad would carry extra ammo for the MG. The same holds true today. Extra ammo for squad based SAWs and platoon level M-240s (light infantry platoons) are all carried by riflemen. Same goes for platoon level mortars, javelin ammo, etc. All this is to say that, for the US Army infantry at least, it is not unrealistic to load them down with at least double what they carry by default. As to the argument about fatigue and how that extra ammo affects them, I tend to think this isn't a problem. Units have a fixed inventory space (a 2 man team can only carry so many javelin missiles, etc) and Western units in general tend to fatigue pretty quickly as is. Plus, if a team is carrying something heavy, they are automatically restricted from being able to 'Fast' move and sometimes even 'Quick' move. That would be approx 420 rounds which is fine. It's the much larger loads that we can have our troops acquire that I was questioning. During the battle of Fallujah a lot of ammo cans (containing both 5.56 and 7.62 rounds for rifles and machine guns) were carried by riflemen from vehicles, supply, etc up to units that were constantly fighting. I would assume this type of behavior as being abstracted when you load down a squad with an extremely large amount of ammo. An additional point would be to mention that you can assume after the scenario ends, all of that extra ammo is put down somewhere, be it back at the vehicles they came from or elsewhere. After all, the longest a scenario can be is 4 hours. Carrying an extra heavy load is manageable for a few hours, and loading them down doesn’t imply that each rifleman will now carry 10,000 rounds til the end of the deployment, which would be absurd. Just a little side note here. When our company or platoon would get some high tech weaponry. Maybe that is not by the book, but human nature works a little different and when you are the one making the decisions as to who to gets such assets, its pretty easy to think you need some of that asset and that you are the best one as to knowing how to use it. Good to know. One question though: if the platoon leader his holding the super cool tech would he be the one to actually use it? Or would he hand it off to someone else when he decides that the time is right to send it down range? The extra Russians will need to be added to an AI Group or they will go to the default AI Group 1. If AI Group 1 has movement orders then they should move with that group unless there isn't enough space in the painted movement order areas, in which case anything could happen with the AI for that group. You may get lucky with adding them but it is by no means guaranteed. No drama mate - I spend most of my time in there and still have to look stuff up or learn things from posts here. Conceptually the editor isn't hard and in practice the mechanics are simple but knowing the editor and making it work to best effect are two different things. Your input was greatly appreciated nonetheless. It is sometimes difficult to get things to work. I have another idea I’ll be working on that is based off the original. @db_zero Great to read that you are having fun and playing around with this in the editor. Having had a quick look at the original scenario AI groups 10 to 15 are not yet used for Redforce. I was mindful with this one that the map is quiet small, and so any increase in redforce might crowd things, but I did experiment with changing the blue force BTR's to Bradleys. I'll see if I can find what I had. In the meantime happy to look at anything you come up with. So I finally tried this scenario today, using the "hold the line defense"...did ok for a while, but shear numbers were pushing me back...and that's before (SPOILERS) the Russian tanks showed up. Will try some other ideas...NOT the best at a free flowing mobile defense especially with UKR forces since I mostly play US.